The Mitchell County Historical Society has a fantastic schedule of programs for 2017. All events are free and open to the public, and we invite everyone to come and find out more about this wonderful place that we call home. Here’s a quick look at what we’re presenting. Check back regularly for updates and more information about our programs! April 17 • 7:00 p.m.
Long before Samuel Bright arrived as an early settler in this region, Mitchell County was inhabited by Native Americans for thousands of years. 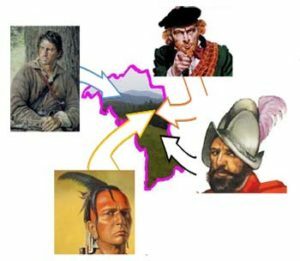 In 1540, their world began to radically change with the arrival of Hernando DeSoto and the Spanish Conquistadors, followed by the English. Join Dr. Daniel Barron as he takes us on a journey to learn about the early inhabitants, visitors and settlers of the Toe River Valley from 8,000 BC to 1540 to 1780. Using history and contemporary Google maps of trails and roads, you will see how you can actually walk in the footsteps of the first indigenous people, the first Europeans, and many of our Scottish and Scots-Irish ancestors. Dr. Barron is a retired Distinguished Professor Emeritus from the School of Library and Information Science at the University of South Carolina and a retired Director of the Avery-Mitchell-Yancey Regional Library. He is a graduate of Appalachian State University, a member of the Mitchell County Historical Society, and a native of Mitchell County. May 15 • 7:00 p.m.
Over the years, there have been stories, events, and individuals who have slipped into Mitchell County’s history and have been forgotten or misplaced. In The Rest of the Story…, David Biddix and his daughter Amanda will bring these back to life, sharing research they have conducted in the gigantic newspapers.com database about the area, where they uncovered stories on individuals and events that have been lost to history. David Biddix is Director of Digital Media for Western Piedmont Community College in Morganton, North Carolina. 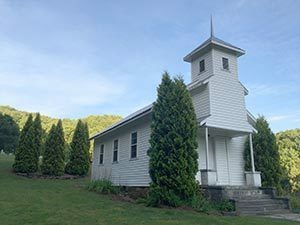 He is also co-author of 3 books in Arcadia Publishing’s Images of America series: Spruce Pine, Little Switzerland, and Mount Mitchell and was a consultant for Voices of the Valley, celebrating Mitchell County’s Sesquicentennial in 2011. A graduate of UNC-Chapel Hill, Western Carolina University, and Appalachian State University, he is a member of the Mitchell County Historical Society and is a native of Mitchell County. Amanda Biddix is a senior at Mitchell High School. She has participated in National History Day, finishing both as a state finalist and representing North Carolina in the NHD National Competition in College Park, Maryland. Her interests are in history and archaeology, and she has participated at the archaeological digs for Joara and the Spanish Fort San Juan in Burke County for the past 2 years. She is also a native of Mitchell County. Monday, June 19 • 6:30p.m. Frankie Silver became the first woman to be executed in Burke County, North Carolina when she was hanged for the murder of her husband Charlie Silver on July 12, 1833. John Silver will present the story of his ancestors and how the famous murder and legend from it continues to endure to this day. John Silver is a descendant of the Silver family and shares a keen interest in their history and story. 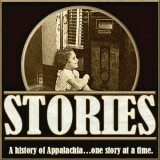 July 17, 2017 • 7:00 p.m.
We have a special treat for July as Steve Gilly & Rod Mullins, hosts of the Stories: A History of Appalachia…One Story At A Time podcast, present a talk on George Lafayette Carter. Carter is most famous in the Mitchell County area for the development of the Carolina, Clinchfield & Ohio Railroad that runs through the County and down The Loops at Altapass, connecting the coalfields of Kentucky with the rail system in South Carolina. However, Carter has other notable achievements, including creating the city of Kingsport, Tennessee, the towns of Coalwood and Caretta, both in West Virginia and the founding of what becomes East Tennessee State University. Gilly and Mulins will share details of the life of this remarkable individual, born in Hillsville, Virginia, who had a tremendous impact on the economy of the Appalachian region. Steve and Rod have been hosting the Stories podcast for 4 years and they have covered a variety of subjects on the program, including several from this area. 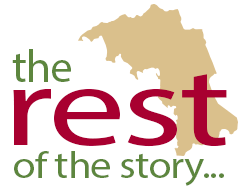 The program publishes two subjects each week and is available through podcast apps on a phone or via their website which is storiespodcast.net. Steve Gilly was raised in Southwest Virginia and worked in radio broadcasting for 25 years (including stints at WLSD, Big Stone Gap, Virginia and WTFM, Kingsport, Tennessee). Later, he attended the University of Tennessee at Knoxville College of Law and is now an attorney licensed in Tennessee and Virginia. He has been a podcaster since 2012, history lover, dad, and grand-dad. 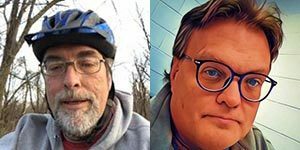 Rod Mullins is a writer, freelance digital journalist, and a native Appalachian seeking positive change and diversity in the negative shadows of feudal Appalachia in addition to his Stories podcasting duties. August 21 • 7:00 p.m.
Rhonda Gouge returns in 2017 with a program on the music of the Toe River Valley. 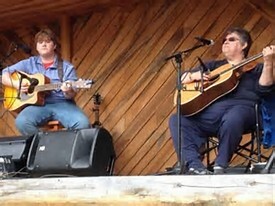 From famous musicians like Del McCoury, Nathan Stuart, Clarence Greene, Sr., and Clarence Greene, Jr., and Fiddlin’ Steve Ledford to local legends like Red Wilson, Mitchell County’s musical history is rich and Rhonda Gouge has played a big part in preserving and promoting the songs and performers who have made it special. She will discuss several musicians and play samples of their work as part of the presentation, plus she will answer questions and share stories with the audience. Come ready to tap your toes and enjoy good old-time music! Rhonda Gouge has been playing and performing in the region since the 1970s, She is a Mitchell County native and has been performing gospel and bluegrass favorites along with teaching musicians. She presented a program on church music for MCHS in 2016. September 18 • 7:00 p.m.
MCHS is pleased to present our final program in our 2017 series Monday, September 18. 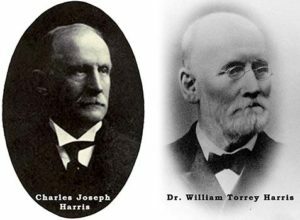 This year is the 100th anniversary of Spruce Pine having a school named after Doctor William Torrey Harris. Chris Hollifield, an 8th grade teacher at the current Harris Middle School, co-author of two books in Arcadia Publishing’s Images of America series (available for sale in our online store), and a member of the MCHS Board of Directors, has been gathering the history of the various schools that have borne the Harris name. He will share stories about the people, places, and events that have made Harris schools a mainstay in the community for a century, plus give a taste of early education efforts in the Toe River Valley. Chris will make the presentation in the Bob & Betty Young Auditorium on the campus of Harris Middle School in Spruce Pine at 7:00 p.m. As always, MCHS programs are free and open to the public and we invite everyone to come and explore the interesting history of how Spruce Pine schools came to have the Harris name and learn the history of educating children in our region.